. Koishikawa 小石川 Koishikawa area . "a governor should worry before people and enjoy after people". The garden shows strong Chinese character in its design, as it was influenced by the West Lake of Hangzhou. Literally this means 西側の片町 half of a village on the West-side. It was on the West side of the 本郷通り Hongo-Dori (the old 中山道 Nakasendo Highway). 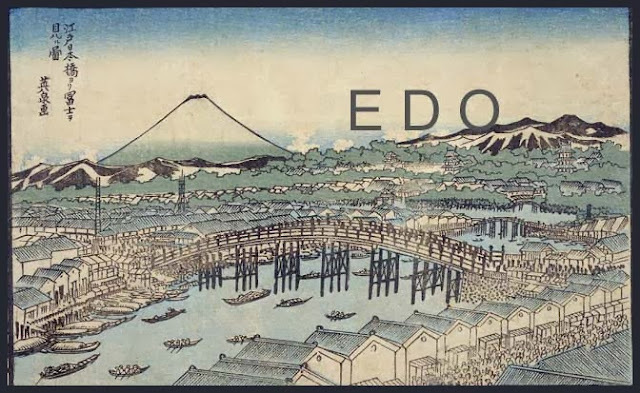 There were many Daimyo and Samurai residences during the Edo period. In 1872, the lord of the 福山藩 Fukuyama domain, 阿部 Abe san, had his estate here and made it open to the public on the West side. Komagome Higashikata machi 駒込東片町 "half of the village on the East side in Komagome. Now it is close to the 東京大学 Tokyo University and many scholars and 文化人 men of culture live here. During the Meiji period, 樋口一葉 Higuchi Ichiyo and 夏目漱石 Natsume Soseki lived here. This area was spared destruction during the Great Tokyo Earthquake in 1923, so it still has the atmosphere of the Meiji period.
. suidō 水道 - the many waterways and canals of Edo . The name dates back to the time of Tokugawa Ieyasu who had a waterway built here. It is known as the 神田上水 Kanda Josui. 金杉水道町 Kanasugi Suidocho, 小日向水道町 Kohinata Suidochi and 関口水道町 Sekiguchi Suidocho.
. Kanda jōsui 神田上水 Kanda Josui waterway . In 1911, the town 牛込水道町 Ushigome Suidocho was renamed to Suidocho. Also related to the 神田上水 Kanda Josui.